Kick off the P2P cycle the right way, right away. Your dream purchasing experience just came true. 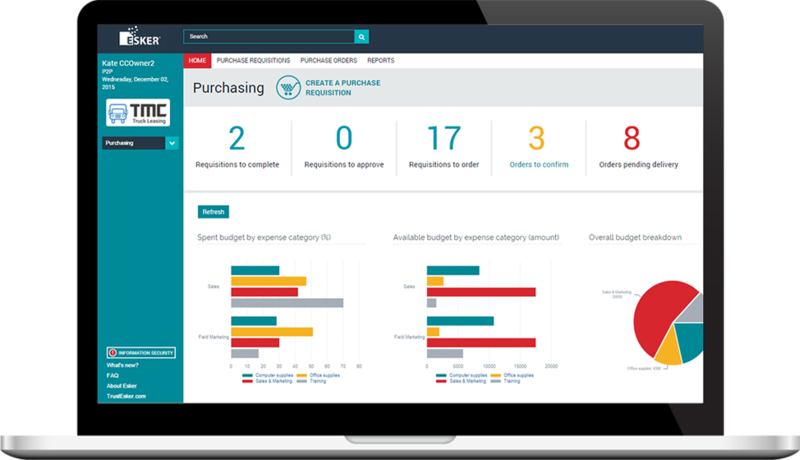 Esker's cloud-based automated purchasing software optimises spend requests and goods/services ordering. What does that mean? It means that every spend request gets the required authorisation, every invoice is matched with a PO, and every product is in one centralised location. And, with its ability to interface with a variety of users in different company departments, the cloud-based solution makes user adoption ridiculously easy. Track and search spend from beginning to end. Spreadsheets are good for a lot of things, but performing real-time budget follow-up isn't one of them. That's where Esker’s purchase order software steps up to the challenge. Every transaction — from request to receipt of goods or services — is tracked, enabling full reporting on requisitions, items purchased, orders processed and payments made. Approve and process requisitions with unmatched speed and precision. Thanks to an automated approval workflow, the correct level of authorisation is always applied to each request and spend is within the agreed-upon budget. Esker users are also granted access to products from preferred suppliers, allowing the purchase to be in-line with company purchasing policies (no more maverick buying!). Additionally, requesters get the items they want from a catalogue of approved items in the required timeframe. The buyer can acknowledge that the approvals have been received, and complete the order in just a few mouse clicks. For managers who are out of the office, Esker Anywhere, Esker’s mobile application, enables them to approve purchase requisitions and review favourite KPIs and metrics anytime, anywhere. Stop leaving accounts payable high and dry. Issues in the purchasing process don’t happen in a vacuum; AP usually has to deal with the chaos caused on the front end, along with the bad reputation that goes with it. Companies can nip this in the bud with Esker’s automated purchasing software — orders are all pre-approved, meaning every invoice processed becomes PO-based and is easily matched with the corresponding PO and goods receipt. Automating on the purchasing end also gives AP staff instant insights into where a particular document is going, where it's been and how long it's been there. Now that's what we call strategic collaboration. Optimise buyer–supplier interactions in the P2P process. Procurement professionals who use Esker are empowered with greater leverage to negotiate price breaks, volume discounts and favourable payment terms. But the benefits go beyond the walls of the company: Esker’s self-service supplier portal also gives suppliers free access to invoice payment status 24/7, as well as fast resolution of exceptions and discrepancies, resulting in a happier supplier base and improved business-to-business transparency. ​Brand your portal interface to match your company’s corporate identity! Customising our application with your own colours and logo makes it easy for your suppliers to identify your company. Have questions about e-purchasing? Luckily for you, we have answers. Tell us how we can help, and our experts will be on to it in no time!